Lactose intolerance and the use of goat milk as an alternative treatment have a longstanding tradition. But, is goat milk really a beneficial alternative to cow's milk for this condition? In this article, we'll look at the root cause and whether the properties of goat milk make it better suited than cow's milk for people with this condition. For many — up to 75% of the world's population, in fact — drinking a glass of milk is not a very pleasant thought. These people suffer from lactose intolerance (also known as lactase deficiency or milk intolerance), the inability of a person to effectively digest lactose, commonly called milk sugar. This inability to break down lactose is fundamentally caused by the lack (or insufficient amounts) of an enzyme normally found in the small intestine known as lactase. Note: This is not the same as a milk allergy, which is a much more serious condition. As lactose accounts for up to 8% of the constitution of milk by weight, persons with a lactase deficiency must usually refrain from milk and milk products, or supplement their diets with lactase before eating or drinking dairy products. Milk intolerance is not a dangerous or life-threatening condition, but it can be very inconvenient and uncomfortable. And, because dairy products are a prime dietary source of important nutrients, lactose intolerant persons usually must actively seek a supplemental or other food source to replace them. Fortunately, the condition is rarely seen in babies, who depend upon milk as their primary nourishment for the first year of life. After the age of 2-3 years, however, children may begin to demonstrate the classic symptoms--the direct result of a decreased production of the lactase enzyme. The inability to produce lactase is primarily a hereditary condition. It's been noted that cultures associated with a longer history of dairy farming have lower incidences of lactose intolerance than cultures in which dairy farming has not been a longstanding tradition. In particular, populations of African American, Native American, Mexican American and Ashkenazic Jews have the highest incidences, while persons of Northern European heritage appear to be the least affected group. An article from the Cornell University News Service reports the results of a study on the associations of geography and culture with the incidence of lactose intolerance in populations. Aside from the hereditary factor, intestinal diseases in adults, such as celiac disease, can also result in insufficient production of lactase. Choose fermented dairy products such as yogurt, cheese or buttermilk over fresh products. The cultures in these products pre-digest some of the lactose, resulting in a lower lactose level. Consume dairy products with other foods--not in isolation. Choose reduced lactose or lactose free commercial dairy products. Is goat milk a better dairy product for this health challenge? The answer to that question seems to be a definite...maybe. On a surface level, it would seem that goat milk offers only a slight advantage, containing only about 10% less lactose than cow's milk. Is that enough to make a difference? In theory, probably not. However, anecdotal evidence of persons who can tolerate goat milk but not cow's milk is plentiful. And, in fact, this article in the National Institutes of Health online database, MedlinePlus, even suggests goat milk, taken with food, as an "easier to digest" alternative for those who are lactose intolerant. So, if goat milk still contains a substantial amount of lactose, how do we explain all of the people who are lactose intolerant, but can eat/drink goat milk and its products with no ill effects? Some people who believe they are lactose intolerant may actually have a mild milk allergy, instead. As you can read in Protein in Milk and the Unique Properties of Goat Milk Protein, goat milk and cow milk proteins differ, so the switch to goat milk may alleviate symptoms if a specific allergy is the real underlying problem. 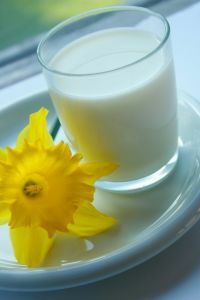 Of course, if you have a known milk allergy or have had serious effects from ingesting dairy products, you should not attempt to drink goat milk or consume any other type of dairy product. Consult with your doctor for guidance. Another plus for persons who are concerned about calcium intake is that goat milk contains about 13% more calcium per serving than cow's milk. This means that you can drink less goat milk to get a comparable amount of calcium--and less intake combined with the lower lactose level in goat milk may just make a winning combination. The bottom line if you are lactose intolerant is that you may be able to tolerate goat milk and its products even if you can't drink cow's milk. Many lactose intolerant people apparently do just fine with it. If you find that goat milk still causes you discomfort, you may want to try the lower-lactose fermented goat milk products such as yogurt and cheese that are traditionally better tolerated than straight milk. And, this article from WebMD reports that a dairy drink called kefir caused almost no symptoms in a study for lactose intolerance. You can learn how to make your own low-lactose cultured goat milk products in Goat Cheese Making and Goat Milk Products. And, if you still experience problems with these choices, you can always use an over-the-counter lactase supplement with goat milk just as you do with cow's milk. Given the nutritional benefits that goat milk can provide, along with the wonderful taste, I'd say it's worth trying! Nutritional studies for goat milk are ongoing, so check back here for any new information related to goat milk and lactose intolerance!